Emulsions form the underpinning of countless personal care products, from lotions, creams and foundations, to sunscreens, hair conditioners and cleansers. However, not only can emulsions provide the very framework of a product, they may also contribute to the more ethereal or subjective attributes that consumers seek. Qualities that capture the attention of consumers—advertised as fresh, weightless, healthy, smooth and protective—may be evoked in part through emulsions with distinctive textures or sensory effects. To deliver even the most basic benefits, emulsion stability is the key, and emulsifiers based on silicone polyether structure, generally known as PEG/PPG-X/Y dimethicone, provide one versatile solution, as is shown in the present article. While some organic w/o emulsifiers provide similar marketable effects, they are usually limited in their ability to incorporate silicone oils for a weightless feel in formulations. Furthermore, silicone emulsifiers are typically liquid at RT and do not require waxes for emulsion stabilization, which create a heavier feel. Silicone-based emulsifiers can impart the same benefits but without many of the disadvantages associated with w/o systems, such as a greasy feel; manufacturing-required heating/cooling, or waxes for stability; and limited flexibility in formulations.2 Further, silicone emulsifiers successfully emulsify the silicone-rich oil phase of formulations and impart expanded texture and sensory possibilities. This is due to the inherent property of their Si-O bond, which is much more flexible than a C-C bond and allows the silicone polymer to maintain a high molecular weight yet remain liquid at RT. This unique structure and its impact on emulsification were previously described in more depth.5, 6 In contrast, w/o organic emulsifiers at higher molecular weights (approx. 1,000 Da) are typically waxy materials, and at lower molecular weights (approx. 500 Da), may need to be combined with waxes for stability. Thus, the ability of silicone emulsifiers to combine high molecular weight with flexibility is a distinctive characteristic that helps to account for their success in w/o systems. As noted regarding form, silicone emulsifiers are liquid at RT, a property that makes them suitable for cold process manufacturing. They also have affinity for both silicone and organic oils, allowing for flexibility in the oil phase and the addition of other specialty silicones for expanded texture and sensory possibilities. Finally, they can emulsify up to 80% water, reducing formulation costs, and they enable the combination of high levels of humectants such as glycerin with emollients to create stable moisturizers with superior aesthetics. The advantages of silicone emulsifiers typically have been applied in color cosmetics—especially foundations since volatile silicone oils are commonly used. Also, w/s foundations are longer-lasting as they are more resistant to wash-off than o/w systems. Yet, despite their increase in popularity, the use of w/s and w/(s/o) emulsions with silicone emulsifiers still lags behind o/w emulsions based on organic emulsifiers. One reason for this could be that w/s emulsions are perceived as complicated systems. However, by understanding the impact of key variables and how to adjust them individually or in combination, formulators can more efficiently create silky fluids, melting creams, hydrating gels and other emulsion products with innovative textures and viscosities ranging from low to high, as will be explained. The formulation of w/s systems depends upon specific practical approaches. Factors such as process conditions and the addition of electrolytes to improve stability have been recognized.7 However, some concepts may remain unfamiliar. For instance, the primary parameters identified in this article as affecting formulation viscosity and stability include the water-to-silicone/oil ratio, mixing process, emulsifier level, nature of the external and internal phases and presence or lack of a co-emulsifier. To understand how silicone emulsifiers impact these parameters, though, it is first helpful to consider their structures. Figure 1. Emulsions with a) PEG-10 dimethicone, b) PEG/PPG-18/18 dimethicone and c) bis-isobutyl PEG/PPG-10/7/dimethicone copolymer. Two general structures define silicone emulsifiers. First is the rake silicone polyether, in which polyether segments are attached to the silicone backbone, as shown in Figure 1. With this structure, alkyl chains can also be added to increase compatibility with organic oils. Examples of this structure include dimethicone (and) PEG/PPG-18/18 dimethiconea, PEG-10 dimethiconeb, PEG/PPG-19/19 dimethiconec and lauryl PEG/PPG-18/18 dimethiconed. Next is the (AB)n silicone polyether, in which polyether segments are incorporated within the silicone backbone (see Figure 2). An example of this structure is bis-isobutyl PEG/PPG-10/7/dimethicone copolymere. Many molecular structures can be designed under these two classes, and depending on the molecular weight of the polymer, they may be available in pure form or delivered from a carrier. The impact of emulsifier type on emulsion characteristics was studied using a standard evaluation protocol. 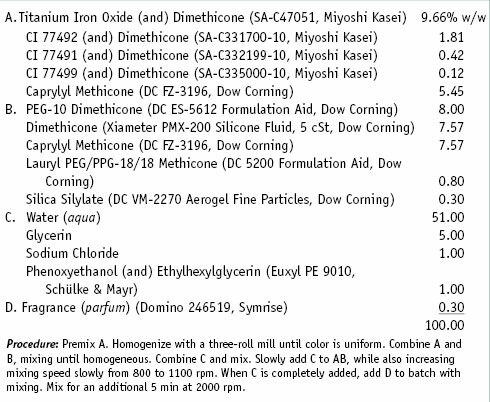 The aforementioned silicone emulsifiersa–e were evaluated in test mixtures comprising various combinations of silicone, silicone emulsifier and a water phase containing 5% glycerin and 1% sodium chloride. The silicone emulsifiers were tested under similar emulsification conditions with different silicone phases: dimethicone 2 cSt, 5 cSt and 50 cSt. Emulsifier levels of 1% and 2% polymer were used, along with different water/silicone phase ratios: 60/40, 70/30 and 80/20. Different processing conditions included an optional high shear mixing step after emulsification. Particle size measurements were taken using a microscopef equipped with a 100x objective on an emulsion diluted to 3.3% in the original oil phase. Visual stability and emulsion viscosity were recorded after one day and one, two and three months; Table 1 shows these relationships for one of the emulsifiers, PEG-10 dimethicone. Particle size: Although particle size cannot fully predict the stability of an emulsion, it is a good indication of emulsifier efficiency and the impact of structure on this parameter. Figure 1 shows the impact of emulsifier molecular weight and structure on particle size—i.e., that lower molecular weight silicone emulsifiers result in smaller particle sizes. The first emulsifier, PEG-10 dimethicone, is a rake linear silicone polyether. The second, PEG/PPG-18/18 dimethicone, is a higher molecular weight silicone poly ether (SPE) than the PEG-10 dimethicone, so it must be delivered from a carrier. The third, bis-isobutyl PEG/PPG-10/7/dimethicone copolymer, is an (AB)n structure. The difference in molecular weight and structure of the emulsifiers results in different stabilities and textures of the emulsions. 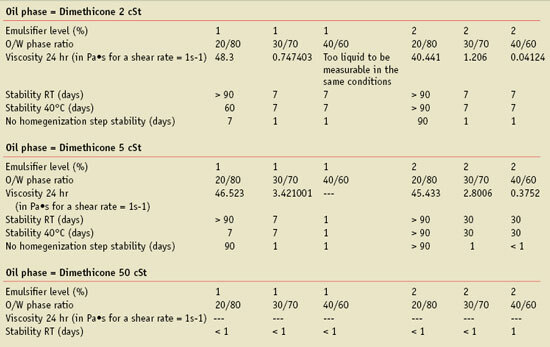 Thus, smaller particle size emulsions have a lower viscosity, whereas combinations of bigger particle sizes change the way in which particles behave; i.e., independent versus clustering, resulting in higher viscosity emulsions (see Table 1). In addition, Figure 2 shows that replacing the silicone carrier cyclopentasiloxane with a low viscosity dimethicone fluid (2 cSt and 5 cSt) had a minimal impact on particle size, allowing for the adjustment of the oil phase volatility without impacting viscosity and texture. Stability and viscosity: Based on the obtained data, it was possible to objectively determine the influence of each variable parameter on the resulting w/s emulsions in combination with particle size. The five variable parameters described—i.e., the water to silicone/oil ratio, mixing process, emulsifier level, nature of the external and internal phases, and presence or lack of a co-emulsifiers—appeared to be critical for achieving a successful w/s emulsion formulation, independent of the rake or (AB)n emulsifier structure. When the internal phase content of the emulsion was increased from 60% to 80%, the final viscosity of the emulsion increased. 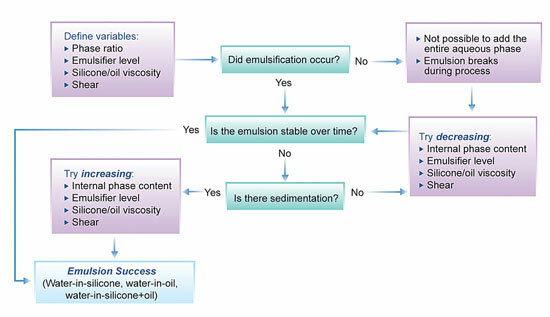 To optimize the stability of the emulsion, the level of emulsifier had to be increased as the internal phase content decreased because if the level of emulsifier was insufficient, sedimentation eventually occurred. In addition, it was important not to add excessive emulsifier to the formulation otherwise the emulsion would become too viscous for the water phase to be incorporated or the emulsion would break during or after processing. The density of the continuous phase also was critical, as it directly impacted the volume of the external phase, which is discussed in further detail later in this article. If the optimum combination of emulsifier level, type of continuous phase, and oil/water phase ratio are obtained, mixing with a regular propeller would be sufficient to produce a stable emulsion. However, high shear mixing applied after emulsification also could help to improve stability with time. As Table 1 reveals, in cases where no additional homogenization steps were taken, stability was inferior compared with cases where such homogenization steps were taken. It is important to systematically adjust and observe all parameters to achieve a stable w/s emulsion with good aesthetics. Table 2 can aid in selecting the appropriate emulsifier, depending on the oil phase composition and the desired emulsion viscosity. 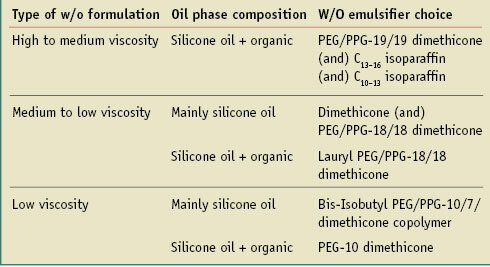 To summarize the experimental results, if it is impossible to incorporate the entire aqueous phase or the emulsion breaks during mixing, the problem is typically one of the following (Note: si-oil represents silicone, silicone + oil, or oil): the level of emulsifier is too high, the si-oil/water ratio is too low, the si-oil phase viscosity is too high or shear during mixing is too high. Further, sedimentation can occur when the level of emulsifier is too low, the viscosity of si-oil is too low, the shear is too low (resulting in large particles) or when the si-oil/water ratio is too high. It was also observed that the viscosity of the emulsion (at the time of preparation) increased when the si-oil/water ratio decreased, the si-oil phase viscosity increased, or the shear increased. In addition, emulsifier levels can affect the viscosity drift of a finished formulation. If the emulsifier level is too low, viscosity may decrease over time; if the emulsifier level is slightly high, viscosity may increase slightly; and if the emulsifier level is too high, viscosity may decrease. With the correct level of emulsifier, viscosity is more likely to remain stable. Based on the study results, Figure 3 shows a formulating and troubleshooting flowchart. Depending on the issue encountered during formulation, it can be helpful to consider multiple options. For example, one approach might include decreasing the amount of emulsifier when it may be tempting to increase it. The stability of emulsion viscosity over time also will improve considerably when the level of emulsifier is well-adjusted. Most formulation compositions are expressed in weight percent; therefore, the density or specific gravity of ingredients is rarely taken into consideration. In an o/w emulsion, the impact might not be so important to final viscosity , but w/o systems require more care. This is because their stability and viscosity are based on silicone emulsifiers that, in turn, are dependent upon phase ratios and controlled by the addition of thickeners to the water phase. Thus, in the case of w/o systems, specific gravity can affect the final viscosity and ultimate stability of an emulsion. For example, isododecane has a specific gravity of 0.74, so 20 g corresponds to 27 mL; cyclopentasiloxane has a specific gravity of 0.95, so 20 g corresponds to 21 mL. As a result, the replacement of one by the other would have an impact on the oil/water ratio, resulting in a lower viscosity for the final emulsion. This difference is illustrated further in Table 3, based on a formulation comprising 2% PEG-10 dimethicone, an oil phase of 20% and the remaining water phase containing 1% sodium chloride. Viscosity was measured after one month at 50°C. This data demonstrates that when changing from one oil phase to another, it is important to take density into consideration and to modify the oil/water phase ratio accordingly to obtain a viscosity that ensures optimum stability. It is also necessary to note that the nature of the oil phase, i.e., polarity and compatibility with the emulsifier, will impact viscosity and stability. In addition to the five variable parameters studied in this article, some ingredients can have an effect on the stability of the emulsion over time, dictating the choice of one emulsifier over another. One example is the use of a high level of humectant in the water phase; in skin care formulations, it is typical to add approximately 3−5% humectants, e.g., glycerin or propylene glycol. Another example is the use of polar solvents. While the application of polar solvents in silicone systems has been recognized,2 this formulation type has had limited success due to its viscosity instability over time and a heavy feel; however, compared with the pure solvent, its aesthetics are significantly better. 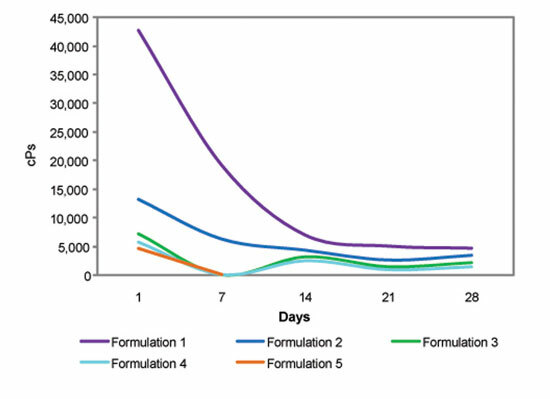 Figure 4 illustrates the impact of increasing propylene glycol concentration in the water phase of a w/s emulsion made with PEF/PPG-18/18 dimethicone in cyclopentasiloxane. Viscosity measurements were taken initially and after 28 days. Table 4 on summarizes the content of each of the five prototype formulations evaluated. Further information developed here will demonstrate that it is now possible to make w/s systems with a high level of humectants, stable with time and with even better sensory thanks to the addition silicone elastomers. A separate study revealed the additional ability of silicone emulsifiers to stabilize other ingredients. A glycerin-in-silicone (g/s) anhydrous emulsion with vitamin C was formulated with PEG-10 dimethicone gels (see Formula 1) and compared with two other emulsions containing either a blend of glycerin and water or water in combination with 10% vitamin C. After the samples were stored for one month at 50°C, the glycerin-in-silicone anhydrous emulsion with vitamin C was found to perform best visually (see Figure 5), which was confirmed by HPLC data (see Table 5). It is interesting to note that the HPLC results showed the (glycerin + water)-in-silicone (g + w)/s emulsion contained a high level of nondegraded vitamin C—more than was expected based on the visual evaluation. In the same study, sensory attributes were evaluated by adding a silicone elastomer to the described glycerin-in-silicone anhydrous emulsion. This further improved skin feel by significantly decreasing the absorption time versus that of pure glycerin, and since the formulation is anhydrous, vitamin C could be stabilized while imparting a distinctive skin feel due to the combination of silicone oil and silicone elastomer in the external oil phase. Formulators might consider that other fragile polar actives could be used in place of vitamin C. This approach masks one of the primary drawbacks of formulations with high levels of glycerin: their greasy and heavy feel. 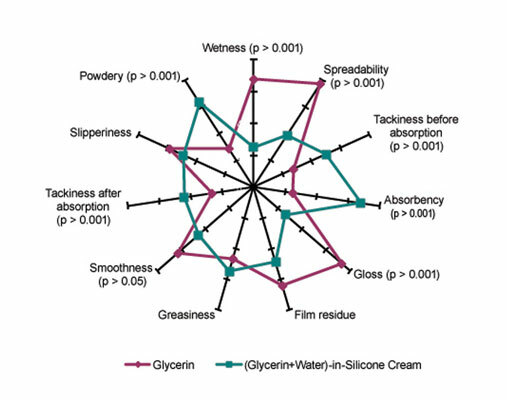 Figure 6 compares the improvement in sensory characteristics between the (g + w)/s formulation containing silicone elastomer and pure glycerin. The (g + w)/s emulsion absorbed significantly faster and was less glossy than pure glycerin. In addition, the silicone elastomer added a perceivable powdery feel, as multiple paired comparison sensory evaluations on the forearms of 18 panelists revealed (see Figure 6); for this assessment, 0.02 g of product was applied to 40 mm ± 2 mm circular areas on the arms of volunteers. The primary issue of applying pure glycerin on the skin was its high gloss and the time required to achieve perceived absorption; these factors were appreciably improved with the glycerin-in-silicone (g/s) system. In addition, due to the high level of glycerin in the formulation, corneometer measurements showed significant moisturizing properties with this type of formulation—an improvement of 40%, compared with untreated skin.8 The same increase in moisturization was found for the g/s emulsion after 6 hr. Formula 2 provides another example of a low viscosity fluid formulation in which PEG-10 dimethicone demonstrated good pigment dispersion properties and enabled the formation of low viscosity, stable emulsions (data not shown). The purpose of the described studies is to help expand the knowledge base for formulating with silicone polyether w/s emulsifiers in order to expose formulators to the performance benefits these distinctive materials provide. With the knowledge to adapt formulations for optimum stability and aesthetic effects, formulators can explore new possibilities with silicone emulsifiers to respond to ongoing consumer demands for next-generation products with innovative textures, feel and improved performance. Acknowledgments: The authors would like to thank Ji Zhouhua (Carrie) for conducting the HPLC analyses demonstrating the stability of vitamin C in the g/s system. COPYRIGHT OF THIS ARTICLE BY COSMETICS & TOILETRIES. WE ARE SHARING AND PROMOTING THE MARKET INNOVATION.